Released in 2004, “Downfall” is a daring film by German director Oliver Hirschbiegel that offers a view of the last days of Nazi Germany inside Hitler’s bunker in Berlin. It is the first and only film I have had the chance to watch that dared to portray Hitler and his inner circle with great care and detail, never compromising its version of reality to avoid the criticism of those who quickly jumped at it to condemn its supposedly sympathetic portrayal of the Fuhrer. The movie spends most of its running time inside the bare concrete structure lit by harsh white lights that would slowly become Hitler’s prison, until it ultimately turned into his crypt. From this labyrinthine maze of hallways is where the Nazi leadership attempted to salvage a war that had already been lost in anyone’s eyes but Hitler’s. The Fuhrer was played by the seasoned actor Bruno Ganz in a role that was unlike anything he had ever done before. The performance is so compelling that I never felt as if I was watching someone play Hitler; it almost felt as if I was watching a documentary based on retrieved footage that captured some of the dying moments of the Third Reich. The role of Adolf Hitler was masterfully crafted by a script that shows us a man that has lost his grasp of reality, often giving orders to his high officials to move troops that were no longer there. Downfall portrays, much like the witness account it is based on, a man that beyond his extreme brutality and disregard for human life, could also be described as undeniably charming, polite and well spoken. Ganz manages to walk this fine line between two polar opposites with ease. He embodies the murderous dictator as naturally as he becomes the soft-spoken man in a performance that ranks very high as one of the best ever put on film. Even though Hitler is given significant air time and dialogue, the tale is told mostly from the perspective of Traudl Junge, Hitler’s personal secretary. Played by the beautifully capable Alexandra Maria Lara, Junge was hand-picked by Hitler to work for him inside his bunker just over two years before the end of the war. The Hitler she meets has the aura of a confident man who has enjoyed the adulation and loyalty of millions of Germans. This Hitler seems healthy, steady and resolute, giving us a glimpse, even if very brief, at the Nazi leader before the collapse of his brutal kingdom. Two years later, the Hitler we see is almost as weak as the desperate efforts of his military to keep Berlin under German control. The deterioration of his physical condition goes hand in hand with his mental sharpness, one that is never contested by any of his officers even when it becomes clear that the leader has lost his grip on reality. The film is difficult to stomach at times. The sickening adulation of his followers is hard to believe, even if many witness accounts have proven them to be true. The mysticism surrounding Hitler must have been powerful enough for perfectly capable and intelligent people to follow him blindly down a very destructive path. Hitler gave Germans a sense of pride and belief in themselves that they had lost ever since their defeat in the first World War. A significant amount of Germans believed in their leader up to the very end. His most ardent followers would put his word and his idea of a world dominated by National Socialism over the safety of their own families. They thought they owed him their life and some would even promise to commit suicide before surrendering to the enemy. An act that even some close to Hitler would find hard to support. 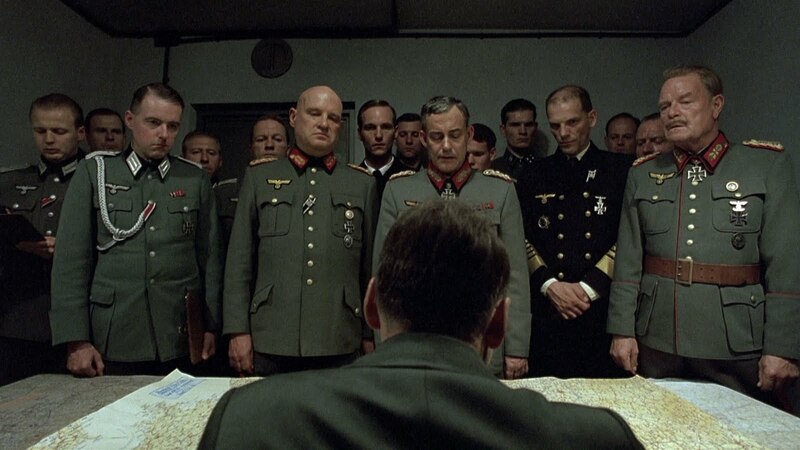 The fact that Downfall takes place in the sometimes overbearing simplicity of the bunker, gives every character a certain crudeness that does not to go unnoticed. Bellow the white light and long narrow corridors, not one man could escape from examination. The Germany we see in the bunker is the direct consequence of a dark period in history in which bigotry, racism and an undeniable thirst for power took over the soul of a nation fueled by a charismatic and paternalistic leader. Downfall’s Hitler is clearly mad. I would not suggest that the director’s view of the Fuhrer is in any way sympathetic. At most, the Hitler we see is a person that deserves nothing more than pity, not because of his absolute failure to impose his will over the world, but because of his utter disregard for compassion, love and anything that makes life so precious. This is the kind of film I don’t mind seeing if I’m in the right mood. Well I’m glad the director’s view of Hitler is not sympathetic, there is no redeeming quality whatsoever about this man, I’m merely curious in seeing just what happens behind the scene that leads or sheds a light to his downfall.